Obviously these are Made in China and costs around $2. Here is a getting started guide around connecting Arduino with M029 JoyStick and testing with basic code. It is a useful thing for robotics. These analog, has 2 axis, PS2 compatible. Exactly like Nokia’s old Symbian mobile phones, we can use this joystick to control a menu, centre click to select or control servo motors. But before doing advanced projects, we need to test with basic code and circuit. These joysticks are nothing but 2 potentiometer and one push button. There are 5 connections to the joystick. Two are for electrical connections – one to +5V of Arduino and another to GND. Other three pins are for Key, Y and X. If you move the joystick, you’ll understand that values of X and Y are changing. Everything needs some adjustment of values. Probably you want to move a dot on 8×8 LED Dot Matrix Display With MAX7219 with the joystick. This Article Has Been Shared 5681 Times! Here is New Test Codes For Arduino Temperature Humidity Sensor DHT11, DHT21, DHT22 Test Code as Hardware (Not Shields). 2 Libraries Needed. 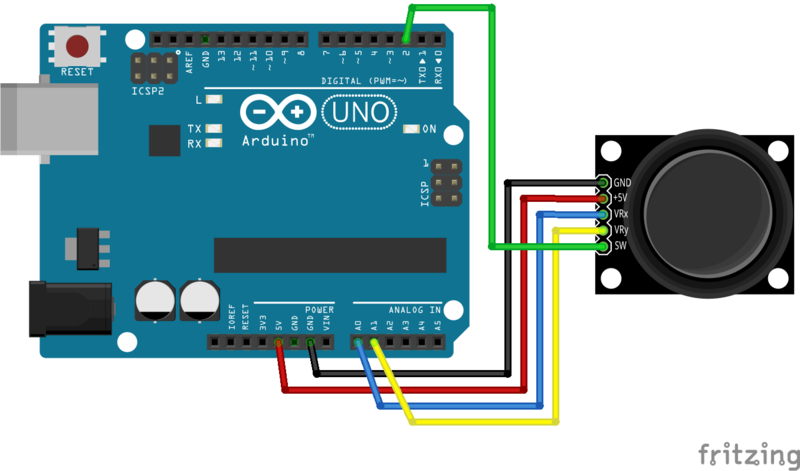 Cite this article as: Abhishek Ghosh, "Connecting Arduino With M029 JoyStick : Getting Started," in The Customize Windows, November 9, 2017, April 25, 2019, https://thecustomizewindows.com/2017/11/connecting-arduino-with-m029-joystick-getting-started/.